Welcome! My name is Edith Bastin, and I am researching the Waddle/Waddell family. This data represents the present state of research which contains descendants (with spouses) and known ancestors for Johnie Franklin Waddell, who married Elizabeth Edward "Betty" Devine of Allen County, Kentucky. Johnie was born 20 September 1868 in Hart County, Kentucky, and died 21 May 1923 in Hart County, Kentucky. Johnie married Betty 3 October 1888, daughter of James Devine and Catherine Gillock. Betty was born 21 November 1868 in Allen County, Kentucky and died 28 January 1938 in Hart County, Kentucky. Many of their descendants are known to still be located in South Central Kentucky and many have relocated throughout the United States. If you have ancestors in Kentucky, especially in the Counties of Hart, Allen, Jefferson, Barren, or Metcalfe, there is a good possibility your family connects with this family line. I began developing this website on 06 August 2001 and will continue adding to this website slowly. So, check back soon for additional updates. If you have additions, corrections, or just want to say "Hi", my EMAIL is epb1937@scrtc.com Thanks! Edith. There are 1841 individuals and 689 families representing 443 surnames in this database. 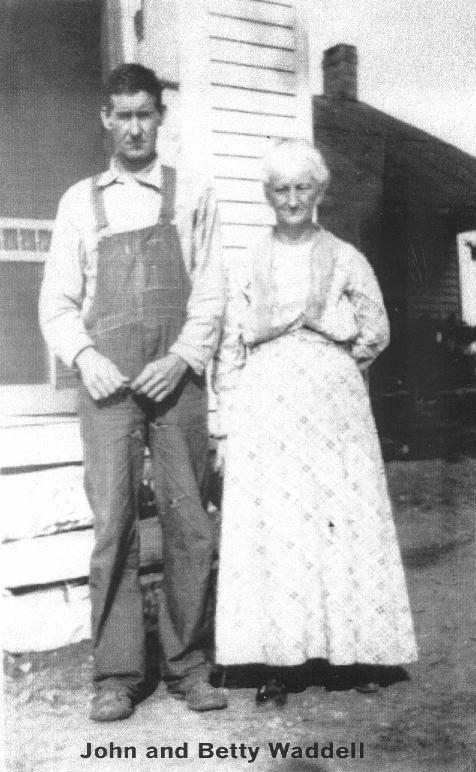 This POLSTON Family originated in Whitley County, Kentucky, and migrated to IA, KS, NE, MO, and MT. 1. JOHNIE FRANKLIN5 WADDELL (ISOM D.4 WADDLE, JONATHAN BLUFORD3, DAVID LARKYN2, DAVID1) was born 20 September 1868 in Hart Co, KY, and died 21 May 1923 in Hart County, Ky.. He married ELIZABETH EDWARD "BETTIE" DEVINE 03 October 1888, daughter of JAMES DEVINE and CATHERINE GILLOCK. She was born 21 November 1868 in Allen County, Ky., and died 28 January 1938 in Hart County, Ky.
i.	CURTIS LEE6 WADDELL, b. 26 July 1889, Hart County, Ky.; d. 19 August 1929, Indiana; m. (1) RUTH LANDIS; b. 1899; m. (2) ESSA "ESSIE" HENSON, 1927; b. 1891, IN. .
ii. ROSCOE CONKLING WADDELL, b. 07 April 1891, Hart County, Ky.; d. 28 December 1957, Indiana; m. (1) BESSIE (1ST WIFE) UNKNOWN; m. (2) MARCIE (2ND WIFE) UNKNOWN; m. (3) HELEN (3RD WIFE) UNKNOWN. iii. ALMA NANCY WADDELL, b. 24 January 1894, Hart County, Ky.; d. 26 September 1976, Larue County KY; m. (1) CLYDE RICHARD WHITE, December 1912; b. 02 May 1887; d. 25 December 1959, Hart County, Ky.; m. (2) NOAH LEE HENSLEY, Abt. 1966; b. 22 November 1882; d. September 1976, KY.
iv. CURL HOUSTON WADDELL, b. 27 February 1898, Hart County, Ky.; d. 24 December 1958, T. J. Samson Community Hospital, Barren County, KY; m. GERTRUDE LEE MCKINNEY, 05 February 1920; b. 28 June 1903, Barren County, Ky.; d. 25 May 1984, Homewood Nursing Home, Glasgow, Barren Co, KY.
v.	ILENE DAWSON WADDELL, b. 29 June 1900, Hart County, Ky.; d. 19 August 1972, Barren County, Ky.; m. JAMES CORDIS 'CORDIE' BASTIN, 12 September 1923, Clark County, Indiana; b. 30 March 1905, Metcalf County, Ky.; d. 06 June 1976, Barren Co, KY.
vi. VERNON LOVELACE WADDELL, b. 30 May 1904, Hart County, Ky.; d. 08 August 1949, Indiana; m. (1) ALLIE PEARL HENSLEY, Abt. 1926; b. 04 March 1904, KY; d. 13 June 1934; m. (2) MURIEL FRANCIS COTTRELL, 08 January 1936; b. 17 May 1903, Cub Run, Hart Co, KY; d. 02 January 1971, Barren Co, KY.
vii. ALLEY MAE WADDELLL, b. 25 December 1906, Hart County, Ky.; d. 25 December 1906, at birth. viii. JOHNIE FRANKLIN WADDELL, b. 29 February 1908, Hart County, Ky.; d. 11 April 1908, Hart County, Ky.
ix. CREAL BROWNLEE WADDELL, b. 16 June 1909, Hart County, Ky.; d. 24 November 1946, Jeffersonville, Indiana; m. LAVORA MILDRED SMITH, 28 October 1930, Jeffersonville, Clark Co, IN. ; b. 03 January 1913, Hart County, Ky.
x.	ALLEN HEATH WADDELL, b. 21 May 1911, Hart County, Ky.; d. 13 February 1990, Hart County, Ky.; m. NEVER MARRIED. There are three free Family Discussion Genealogical Mailing Lists for individuals to research the WADLE, WADDLE, WADDELL Family lines. The lists are intended for the WADLE, WADDLE, WADDELL Family worldwide with all spelling variations of the surname. Our goal is to link as many family lines as we can! Type "Subscribe" for the subject and message in your Email. Portions of this page was produced by GED2WWW version 0.22 compiled on Apr 17 1997 at 19:45:45. GED2WWW © 1996,1997 Leslie Howard. GED2WWW is free software, distributed under the terms of the GNU General Public License. For more information about GED2WWW or the GNU General Public License, contact Leslie Howard at lhoward@ix.netcom.com or visit the GED2WWW webpage at http://www.netcom.com/~lhoward/ged2www.html .